Where the high desert meets the eastern slope of the Sierra Nevada. It's home to the mighty and expansive Owens Valley, the deepest in the lower 48, and one of the only known super volcanoes on the planet: The Long Valley Caldera, just south of Mammoth. The vistas are astounding, the weather is prime and the climbing is even better. The Eastside offers an almost incomprehensible amount of clean, climbable rock, including sport climbing at Owens River Gorge and Clark Canyon, bouldering in the Buttermilks and Happy Boulders, and alpine climbing on 14,000' granite peaks. On rest days, soak your sore muscles and relax in the numerous natural hot springs... could this be paradise?? From Los Angeles, head north on Hwy 14 through the desert towns of Palmdale, Lancaster, and Mojave to join Hwy 395. The scenic 395 parallels the eastern Sierra through the Owens Valley from the L.A. basin to Reno. Lone Pine is the first "major" town (pop. 1,655) en route, and is the jumping off point for Mt. 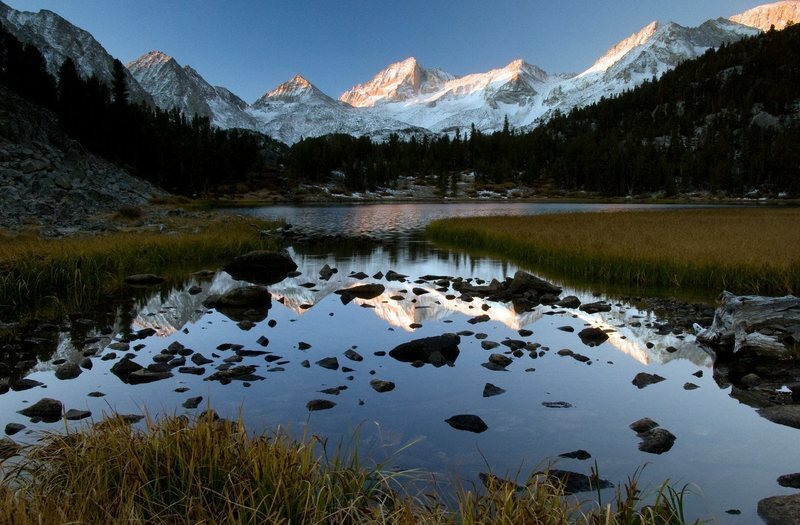 Whitney and other popular destinations in the John Muir Wilderness (see High Sierra section). 60 miles north is the town of Bishop (pop. 3,575). Bishop was home of the late, renowned climber/photographer Galen Rowell, who, along with his wife Barbara, was killed August 11, 2002 in a small plane crash outside town. Rowell's gallery, the Mountain Light, is located at 106 South Main Street in downtown Bishop. Lenticular over White Mountains. Photo by Blitzo. Twin Lakes and Sawtooth Ridge. Photo by Blitzo. Mono Craters. Photo by Blitzo. The enormous Mt. Tom, from the Sherwin Plateau. Fall color-Sierra Eastside. Photo by Blitzo. Buttermilk Country. Photo by Blitzo. Sierra moonrise. Photo by Blitzo. Eastern Sierra in early Spring. Sunset near Bishop. Photo by Blitzo. Red Mountain moonrise. Photo by Blitzo. Blazing Star. Photo by Blitzo. Sierra Eastside storm. Photo by Blitzo. Eastside panorama. Photo by Blitzo. Big Bowls. Eastside White Mountain Peak. Bouldering at Deadman's Summit. Sierra Eastside. Alabama Hills-Morning. Photo by Blitzo. Mono Lake-storm. Photo by Blitzo. Wheeler Crest during a fall storm. Cardinal Pinnacle. Photo by Blitzo. Crystal Geyser Crags. Photo by Blitzo. Mono Lake sunrise. Photo by Blitzo. Storm on the White Mountains from Owens Valley. The passing of Fall, McGeeCreek. Photo by Blitzo. The unique formations of the Crowley Lake columns. Storm-Alabama Hills. Photo by Blitzo. Alabama Hills-Cattle Pocket. Photo by Blitzo. Fall storm clearing west of Bishop. The Druid Stones and Wheeler Crest. Bouldering at Faultline. Photo by Blitzo. Basin and White Mountains, early Spring. Whitecaps on Mono Lake on a very windy day.